Whether it’s an ordinary day or St. Patrick’s Day, be gladdened by these funny and wry Irish sayings. If you watch television or movies, or even read books, you’d come across many Irish stereotypes. These include stories about leprechauns, pots of gold at the end of the rainbow, and even the Irish mammy. And the amusing thing is, a lot of them are generally true. For one, they are passionate, funny, and creative. There are many Irish comics who are instant hit with local and international audiences. Ireland’s tradition of humor and storytelling, coupled with a gift for the gab, has led to much success onstage or in mass media. And then there are some funny traits like procrastinating, love for drinking, tea, and potatoes, and obsession with the weather. Celebrate the indefatigable Irish spirit and wisdom with these Irish sayings! The reason the Irish are always fighting each other is they have no other worthy opponents. If you’re enough lucky to be Irish…You’re lucky enough! Always remember to forget the things that made you sad. But never forget to remember the things that made you glad. A son is a son till he takes him a wife. A daughter is a daughter all of her life. May you have a bright future – as the chimney sweep said to his son. It’s not a matter of upper and lower class but of being up a while and down a while. A man may live after losing his life but not after losing his honour. There is no luck except where there is discipline. May neighbors respect you, trouble neglect you, the angels protect you, and Heaven accept you. May you be poor in misfortune, rich in blessings, slow to make enemies and quick to make friends. And may you know nothing but happiness from this day forward. 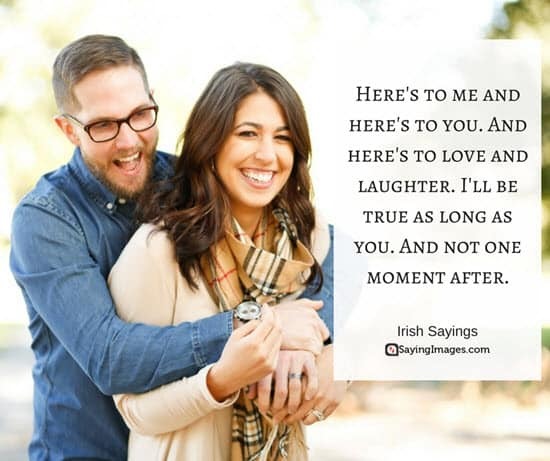 Share these funny and inspiring Irish sayings with your friends and family!